In many, but not all, Plains Aborigine societies (Siraya and Makato especially), there was a cultural taboo against marriage and live births before the age of 32 for women and 34 for men. It is believed that this tradition served two simultaneous goals. The Sirayic or Tsouic cultures practice uxorilocal marriage in which the man marries into the woman's house. Siraya used an age-grade system to mete out access to various forms of cultural power and responsibility much like the traditional Amis. When Siraya men achieved a certain level of status once his headhunting days were over, he would pluck the hair on part of his scalp and retreat to a position of "elder". This was the pinnacle of his power. The Siraya also used this age grade system to manage the sexual division of labor in which the men hunted game and prepared for war. The women reared children, did the weaving, tended the fields and did other housework. European reports often regarded the men as "lazy" and the women as "hard working". This is because the younger men spent their time hanging in the bachelor house repairing weapons, repairing bodies and preparing for the physical demands of the hunt or the battleground. So, a prohibition of marriage and live births before 32/34 respectively ensured that (a) a man could risk his life in the hunt or on the battlefield to secure heads without fear of leaving a wife or child if he should die. (b) When a man turned 34 his body would be wearing down and he would no longer be as spry as the young men (yes, we all remember when it happened to us). The man would then be free to marry and move into his wife's house. By this time her father would be in his mid-sixties and realistically too old to compete with his son-in-law as the top man of the house. By that time, if he were still alive, he would be relegated to helping the women with the farming and house chores, which would have relegated him to the status as a "female" and have really no standing in the community as he would be too feeble to participate in "manly" activities. When the Dutch introduced Christianity, many of the younger Siraya welcomed the change as it allowed them to leapfrog their way to higher positions in the community without having to abide by the age grade system. I imagine this may have led to an explosion in live births that may have later been misrepresented as Han settlement. Later, during the Cheng and Qing administrations, it is conceivable to believe that many other indigenous groups also experienced a baby boom as they acculturated into Confucio-Han beliefs. I can even see how it may have been embraced by older men who may have felt more revered under the system and able to sire more children. What is clear is that under the Chengs there was a lack of available women. There had also been enough cases of Han/Aborigine cohabitation under the Dutch to make the Dutch registers. The Chengs had to import something like 20,000 women from present-day Vietnam, Indonesia and China to appease the ranks. Despite the various maritime quarantines, many women made the trip. A lot of men also retreated back to China. Still lots of questions that remain, but I think the indigenous contribution is greater than currently accepted, but not as high as many might wish. Let me just add that by the 19th century there were many villages already described by Europeans as "half-caste". It is unclear how the offspring of cross cultural marriages viewed their ethnicity, but by Han cultural norms they would have been regarded as Han and thus may have led to some confusion in the records. Another important note is that in the Confucio-Han cosmologies adopted by the Qing, the blood, DNA or direct descent was not regarded as being very important. Having a child tend to ancestral graves and work all the Fengshui was far more important than blood. This made interethnic adoption a very accepted and common way for Indigenous children to become Han. The importance of blood only came after the arrival of Darwinian science and the ethnic nationalist movements of the latter 19th century. In the winter of 1945, while escaping from the settlements in northern-most Chinese territory 黑龍江, 15,000 Japanese 開拓團 refugees arrived in 方正縣, 180 km east of Harbin [see map in http://danshuihistory.blogspot.com/2010/05/manchuria-1946.html]. Roughly 5,000 of them perished from exposure, starvation, disease, and suicide, and 4,500 young women and children were adopted by the locals [see also: http://danshuihistory.blogspot.com/2010/04/blog-post.html]. In 1946, on humanitarian grounds, the remains were collected and cremated, and buried in a mass grave. 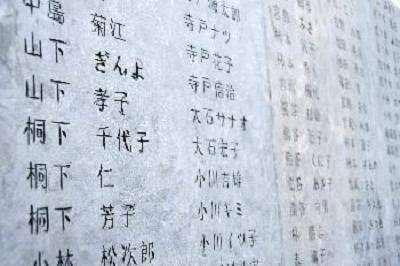 In 1963, the CCP central gov't approved the construction of a grave site and named it "方正地区日本人公墓" and the ashes were re-interred in this site. In 1973, the grave was relocated to the present site. 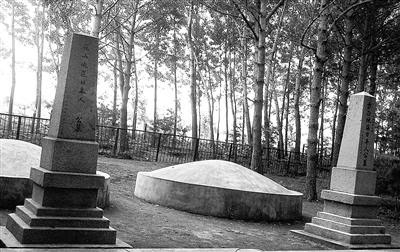 And in 1984, 530 sets of remains from 麻山 District [those massacred by the Soviets] were buried next to the original one with an identical monument, marked the "麻山地区日本人公墓" (see photo above). In the 1970s, most of these Japanese orphans were repatriated back to Japan and, in gratitude, they have built a memorial, near the graveyard, to honor their Chinese foster parents. The historical twist was quite complicated and now at least 48% of the 方正 residents have some ties with Japan as a result. Since the 1990s, building a memorial wall listing the names of the deceased has gained enthusiastic local support. With private and public funding, the wall was eventually built and the graveyard opened to visitors from Japan. 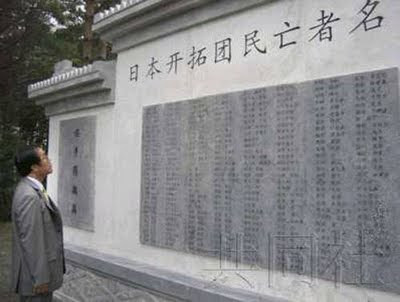 On 7/30/2011, a micro-blog post reporting the Japanese Consul General in Shenyang visiting a memorial dedicated to the "Japanese invaders/war criminals" went viral. And the always overly patriotic Chinese netizens quickly organized themselves, threatening to totally demolish the wall. On 8/3, 5 netizens/vandals [from Hunan, Hebei, and Henan, members of a certain “中国保钓联盟”] came to the grave site and splashed red paint on the memorial wall after failing to take it down with hammers [above]. On 8/6, in the middle of the night, the memorial was hastily removed by the local gov't leaving only a slight depression behind. More outside netizens arrived at the graveyard seeking to do more damage. After seeing no memorial wall on site, they lit firecrackers to celebrate the "victory of justice". 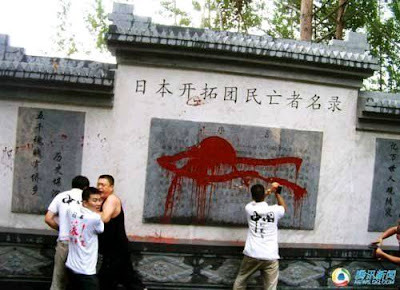 It appears extremists-nationalists now not only rule the virtual world in China, they have also gone beyond spewing words of irrational hatred into physical violence. In the meantime, the citizens of 方正縣 are now labeled as 漢奸 - a term heard quite often in the immediate post-1945 days in Taiwan. Following the display of this patriotism, Chinese-style, one netizen in Taiwan questioned Ma Ying-jeou's honoring 八田與一 (Hata Yu-ichi, 1886-1942), the Japanese engineer who designed and built 嘉南大圳 during the Japanese Colonial era [Mr Hata's ship was torpedoed and sunk by an American submarine while enroute to the Philippines and Mrs Hata committed suicide one day after Japan surrendered]. Fortunately, "就事論事,恩怨分明", not twisted logic to justify the blind hatred of all Japanese, still prevails in Taiwan. The above is a map of the 4 major migration routes in the Qing era [click to enlarge]. The migrants/immigrants originated principally from 泉州Chuan-chow, 漳州Chang-chow, and 潮/惠州Chau/Hui-chow 府prefectures. The first two groups are the Hoklo and the last, mostly Hakka. Together, they are conventionally known as the Taiwanese. Since the number of illegal migrants/immigrants has also been debated as far as the origin of Taiwanese, another discussion here may help clarify this matter somewhat [even though a previous post has already touched upon the subject, see here]. (2) Corrupt immigration system and people smuggling were the major factors. These two are not necessarily mutually exclusive; although they have now become so owing to, IMHO, incomplete or falsely constructed information. The only way to resolve the issue is to re-visit the immigration history of Taiwan. Take the 羅漢腳 [the Loitering Bachelors] for example, some of these poor souls did intermarry with the Aboriginal women in the early years of the Qing rule. [Left: in the countryside, small shrines such as this one were built to commemorate the 羅漢腳 who died young and family-less.] They entered Taiwan either legally or illegally - illegal if they could not pay the exorbitant permit fees and paid the less expensive people smugglers instead. However, it'll be way too simplistic to regard them as the ancestors of present-day Taiwanese. Unless the Aboriginal men had all forfeited their right to propagate, the number of intermarriages would have been quite small. There is a modern-day parallel: the intermarriages between KMT veterans [the "老兵old soldiers"] and Aboriginal [and Han] women in the past 60 years, are also quite rare, even newsworthy at times. The first wave of immigration refers to that before and during the Dutch era. This is irrelevant to the present discussion. The second wave lasted from 1661 (the beginning of Ming-Cheng) until 1735 (the end of the 雍正 period). During the Ming-Cheng era, an estimated 100,000 to 150,000 Southern Hokkienese migrated to Taiwan. However, with the Ming-Cheng soldiers forced back to the mainland, and a restriction by the Qing law enacted in 1683, the 「台灣編查流寓條例」, the number of Han-people would have been at an all-time low shortly after 1683. [Note: this Ming-Cheng turncoat 施琅's law stipulated that 1.渡行台灣者必須事先取得許可，密航者處以懲罰。(Permit to emigrate to Taiwan is required; violators will be punished - hence the thriving smuggling industry. ); 2.渡行台灣者不得攜眷，已渡臺者亦不得接取家族。(No family members allowed into Taiwan - usually the wives - held as hostages for a better control of the immigrants and the garrison force. ); and 3.廣東屢成海盜淵藪，因積習未改，其住民不許渡臺 (Canton is frequently a home to pirates, its residents - including the Hakka - therefore are not allowed into Taiwan.] The 羅漢腳 and the "absolutely no Cantonese/Hakka allowed" policy were both a part of this legacy. 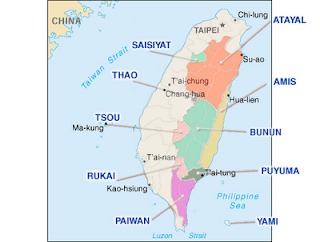 For the well-to-do "pioneers/developers", they could afford to travel back and forth between Taiwan and the mainland, much like the 台商 of today except in reverse. This was not so for those loitering bachelors who often became unruly and a menace to the society. Some readers may have been under the impression that this 1683 law was strictly enforced throughout the Qing rule. This was not the case at all. Even under the restriction, many immigrants still prospered and their families later became prominent Taiwanese families. For example, 連横Lien-heng, the author of 台灣通史, descended from 連興位 who emigrated to Tainan in 康熙二十一年 (1682). And from Chang-chow prefecture alone, families identified by 49 surnames arrived and settled in southern Taiwan. This suggests a certain degree of laxity in enforcing the immigration law. 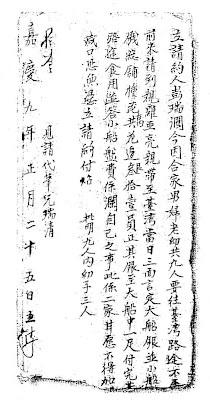 By the end of the 雍正 reign (ca 1735), local officials petitioned the Qing Court for a relaxation of the ban. The governor of Taiwan-fu 沈起元 had requested an increase in the number of immigrants from Hokkien, in his 《條陳台灣事宜狀》, he stated that "漳泉兩地無籍之民，無田可耕，無工可傭，無食可覓。一到台地，上之可以致富，下之可以溫飽"[in both Chang-chow and Chuan-chow, drifter-people with no land to till, no job to hold, no food to feed on will become rich or at least well-off once they arrive in Taiwan]. This proposal had received wide support, and the Qing Court relented. The third wave of immigration started in 1735, until 1895 (when the Japanese took over the island). In 1735, immigration of whole families was permitted. Between 1732 and 1875, the law changed from officially sanctioned immigrants on "官渡" only, to including private immigration through "私渡", allowing brothers, couples, or the entire extended family if they migrated together. These plus the illegals were the core groups of Taiwanese, not those few during the second wave that had intermarried with the Aborigines. And according to 台灣通史, by 嘉慶十六年(1811), over 2 million Han-people now resided in Taiwan. In 1746, 林石 moved to Wufeng霧峰, his descendants were well-known Qing generals that included 林文察 and his son 林朝棟 (a major player in the Sino-French war in 1884). In 1778, 林應寅 migrated to 新莊 and in 1781, his son arrived in Taipei, these were members of the 板橋林家 (the Lin Family Garden is a perennial tourists' attraction). These and most other families from both waves can trace their family roots back to Hokkien and beyond. The Qing restriction was finally lifted in toto in 1875. The law was never enforceable in the first place and people smuggling never stopped for as long as the demand was there. In 1759, for example, the gov't caught 25 smuggling operations in action resulting in the arrest of 990+ illegals. The Hakka came in later and fewer in number than the Hoklo in part because of the initial total ban (both men and women). The first recorded 械鬥armed gang warfare between the Hoklo and the Cantonese (Hakka) was in 1721 [i.e., during the restriction period when the Hakka were supposedly banned] that took place in Feng-shan, a population center since the Tung-Ning Kingdom days. These deadly fights in other heavily populated areas were to continue until 1862 or even later, but that is another story. In the past few years, media reports on the origin of the Taiwanese have appeared with headlines such as "85% of Taiwanese are the descendants of the Aborigines", "Taiwanese are not Chinese", etc. Reporters in Taiwan tend to sensationalize issues using mis-interpreted information, so these are not quite that surprising. To avoid confusion, the abstract in English and a summary in Chinese of the original paper published in 2001, written by Dr Lin Ma-li herself, are both quoted below, so readers can get the first-hand info and form their own opinion [note: red highlights are added for clarity]. (4) the Southern Han with 3 subgroups were different from the Northerners; how close the modern Taiwanese are to the Southern-Han remains to be investigated. There was never any mention of "Taiwanese were not Chinese" anywhere. 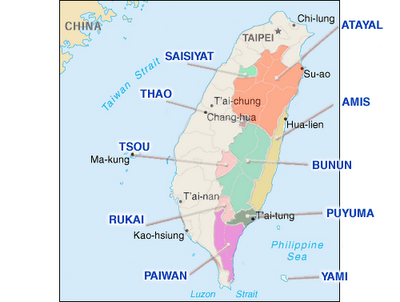 "The Minnan and Hakka people groups, the so-called “Taiwanese”, are the descendants of early settlers from the southeast coast of China during the last few centuries. Genetically they showed affinities to southern Asian populations, as determined by phylogenetic trees and correspondence analysis calculated from HLA allele frequencies. This corresponds historically with the fact that they are the descendants of the southeast coastal indigenous population (Yueh) of China and should therefore not be considered as descendants of “pure” northern Han Chinese. A33-B58-DRB1*03 (A33-Cw10-B58-DRB1*03-DQB1*02), the most common HLA haplotype among “Taiwanese”, with a haplotype frequency of 6.3%, has also been found to be the most common haplotype among Thai-Chinese and Singapore Chinese, two other populations also originating from the southeast coast of China. These observations suggests that this haplotype is the most well-conserved ancient haplotype of the Yueh." Among the 100 volunteers, 67 have a "blood relation" with the Aborigines, SE Asian Islands people, and Asian continent groups. Of the other 33, 18 carry an Aboriginal gene, 10 have the Yue characteristic, and the rest, a mixed bag. So, based on bloodline analysis, 67 are found to have markers from the "Aborigines or SE Asian islanders [and the Asian continent component now omitted for some reason] on either the maternal or the paternal, or both sides. The other 33 all have bloodline markers from the Asian continent; although 18 are with possibly an Aboriginal tissue antigen marker. Combining all three markers, then you end up with (67+18)/100 = 85% [without taking mutual-exclusivity into account, however]. It was more speculative than conclusive at least as far as the tissue antigen. And it was a combined "原住民及或[and/or]東南亞島嶼族群的基因" implying the Aborigines in Taiwan share a common genetic marker with the SE Asian islanders. In this sense, the claim of "85% of the Taiwanese descended from the SE Asian islanders" would be equally valid, migratory history notwithstanding. Since all discoveries in science must withstand the time-test, Lin's study can be regarded as a theory based on some preliminary data. The protein-coding genes alone consist of as many as 30,000. Three markers are not nearly enough. It also should be noted that Lin's serological study was based on blood samples from 100 donors and the tissue antigen study from fewer than 250 volunteers. 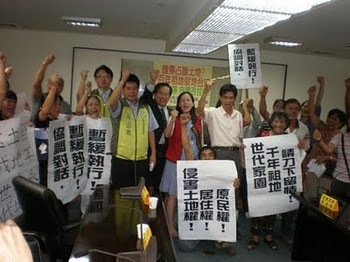 The participants were non-randomized self-proclaimed non-aboriginal Taiwanese. Extrapolation of the findings to the entire population therefore must be exercised with extreme caution. The rebuttals often emphasize that Han is not a race but a culture and, Lin herself also concurs, that Taiwanese are whoever regard Taiwan as their homeland. Let's just say the verdict is still out as far as the origin of the Taiwanese. For an important issue such as this, the scientific evidence must be irrefutable. We therefore advocate a nation-wide (not a small sample) mitochondrial DNA study. It is often assumed a priori that the Aborigines in Taiwan were forced out by the newly arrived Han settlers. While the contests for land between the highland Hakka and the Aborigines were quite frequent, often with deadly results, it was far more common for the Qing era new immigrants to acquire land through purchases. The above [source: http://www.darc.ntu.edu.tw] is an executed purchase agreement between a plaines aboriginal seller by the name of 利加力龜達 and two "honest [according to the document]" Han-buyers 郭然 and 石普. The transaction took place in the 11th Month of 嘉慶九年 (1804) for a parcel of land located in 金包里 (now 金山, north of Danshui). The agreement detailed the boundaries of this piece of land and the purchase price of 40 silver dollars. And the reason for selling was because the owner was no longer capable of tilling the land which he had inherited from his grandfather. The permanent nature of this sale was also stipulated in the contract. 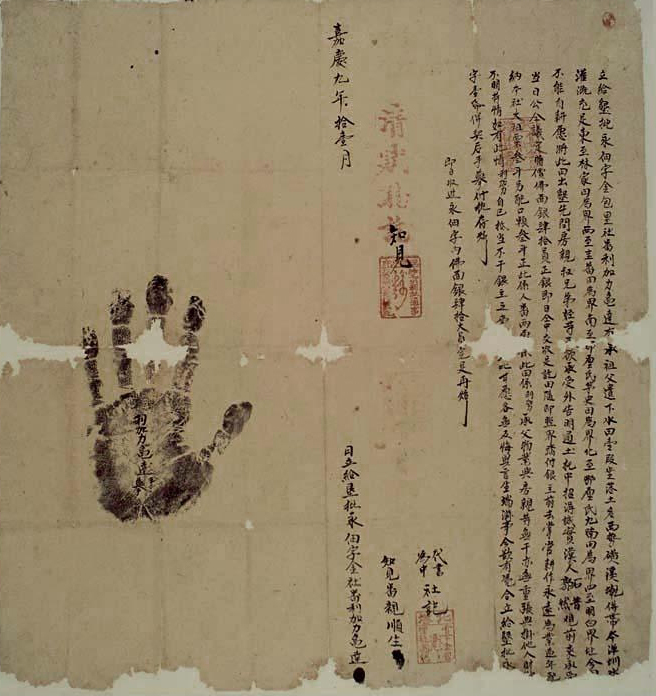 It was signed with a thumb print by the seller and also by his witness, a relative named 順生. 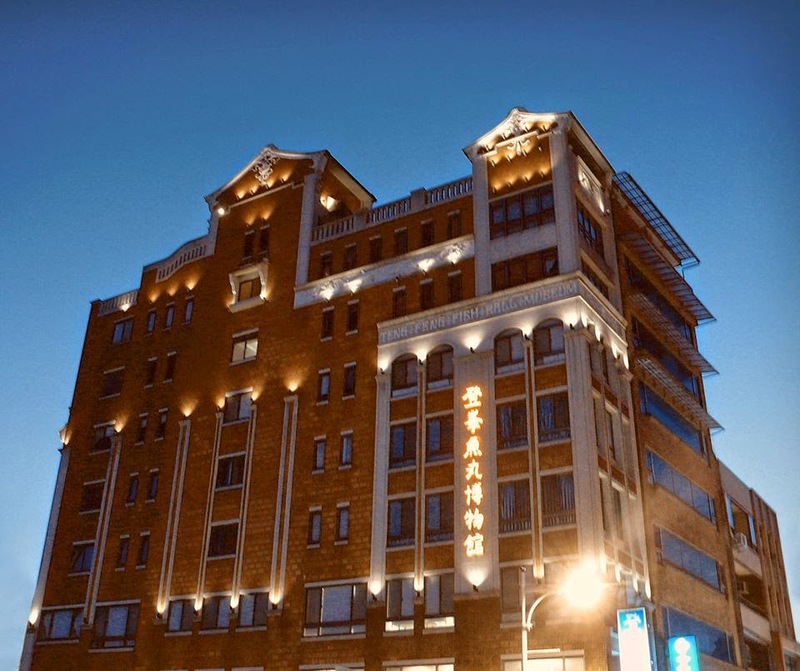 The official seal of approval was stamped by 翁麗力, the village manager/interpreter, a Han-Chinese, and the commission was also specified in the agreement. The aboriginal seller, most likely an illiterate, had also approved the deal with a palm print. This was usually how the Aborigines parted with their land ownership during the Qing period that had actually continued into the early Japanese colonial [the Meiji] era. Many such purchase agreements have survived and some archived. The transactions appeared fair and square, at least on paper. Although, despite the lack of evidence, argument to the contrary, i.e., the Han-Taiwanese must have short-changed the ignorant/innocent Aborigines in some way, persists to this day. Naturally, this is not to say that there had never been any instances when the Aborigines were cheated by the Han-people [or vice versa for that matter] for 400 years is a long time. In fact, in early years, there were reports that some Han-men married Aboriginal women for their properties. At least one aspect appears clear that the Aborigines were not forced at knife-/gun-point to give up their land. Now, with more primary documents becoming available, a better understanding should result. To complete the post: there were other ways for the Aborigines to lose their land ownership. During the Japanese era, those who leased their fields to Han-tenant farmers lost the land title to the government - which abolished the "big bad landlords slave-driving the little tenants" system, allegedly. The land was actually confiscated for developmental purposes, e.g., for growing sugarcane crops and building of sugar processing factories. And often through the eminent domain, whole tribes were relocated to remote areas. This vast governmental land holding was taken over by the KMT gov't in 1945, never returned to the original owners/tribes. And starting in 1947, the 公地放領 [Distribution of the Public Land] component of the 耕者有其田 [Tillers Own Their Own Land Reform] policy has made the situation from bad to worse. This has been a major source of discontent ever since. 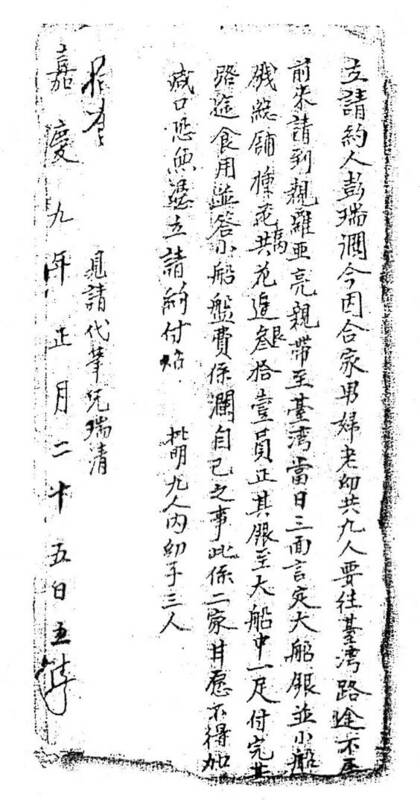 This is a contract between a Mr 彭Peng and a Mr 羅Luo, prepared by Peng's brother [click to enlarge; for more, see: here]. In it, Peng had agreed to pay exactly 31 [Mexican] dollars for his family of 9, male-female-old-and-young including 3 children, for the passage to Taiwan, on board of Luo's junk. Peng was also responsible for the meals along the way and also a transportation fee on a small ferry upon arrival. The contract was dated the 9th Year of 嘉慶 , the 25th Day of the 1st Month. Since this contract carried the official signature of approval, it would contradict the oft-cited Qing prohibition of migration from China to Taiwan except selected males. It was unknown from which port this family started their journey or the eventual destination; although it would appear to be from Amoy to Lakjemuyse. Prior to the late 18th Century, 鹿耳門Lakjemuyse, literally the Deer's Ear Gate, was the only port of entry for ships sailing from China. After registration and inspection of passengers and cargoes, they were then allowed to sail to other ports of Taiwan. In 1784, another port of entry was added, the 鹿港Lu-Kang Port in Changhua. Danshui/Bali was added in 1792. And in 1826, two more ports, 海豐港Hai-feng Port in Changhua and 烏石港Wu-shi Port in I-Lan were also opened. Each port had a corresponding port of exit in China, for example, Lakjemuyse received ships from Amoy, and Danshui, from Foochow (from the 五虎門 Port). These were the officially sanctioned ports. Although, much like the porous borders in the US today, illegal entries were quite common as the whole coastline of Taiwan was readily accessible, plus it was only an overnight trip from China when the conditions for sailing were right. The year 1804 was also when the 白蓮教White-Lotus Cult uprising was finally quelled by the Qing. This peasants' revolt, provoked by ruinous taxes and extremely harsh rules, started in 嘉慶元年(1796) in Hubei Province and quickly spread to Henan, Shangxi, and GanSu, and finally to Sichuan. This 9-year internal war had consumed much of the Qing financial resource. And the recovery was riding heavily on the backs of the common folks. In the same year, 1804, Hokkien and Zejiang governments jointly started a campaign going after the marauding pirates. One of the main gangs was led by Chua-kang [Taiwanese pronunciation of 蔡牽]. In 1805, Chua attacked Lakjemuyse and Hobe/Bali. And in the 4th Month of the following year, Danshui/Hobe was sacked and occupied by Chua and his men, and a massacre ensued. To this day, Danshui-ren still commemorate those who died in this unfortunate incident [known as "敗滬尾", celebrated each year on the 18th Day of the 4th Month, lunar calendar]. Chua was finally defeated in 1809 near the Pescardores and committed suicide by blowing up his own ship. So the 彭Pengs had voted with their feet, so to speak, leaving China for the dreamland, Taiwan. Judging from the handwriting and the language of the contract, the Pengs appear highly educated and well-to-do, not a family that needed to emigrate. It might not have been an easy decision at all. The war had also followed them to Taiwan, unfortunately; although it was quite unlikely that they happened to be in Danshui in 1806 and lost their lives there. Hakka-Pengs in fact constitute more than 70% of the Pengs in Taiwan and they typically reside in Hsin-chu, Miaoli, and Taoyuan. A good guess is that this family was also Hakka coming over to join other Pengs in, e.g., 竹東Chu-tong known to be a Peng stronghold, and the descendants have long become the locals.